The following article appears on the Me2 Solutions web site. I do not know anything about Me2 Solutions, but they provide an excellent overview of the OODA Loop. It may seem like a long read, but its usefulness in business, and even litigation, will quickly become evident. You've probably never heard of the OODA loop–which is a shame, because you're probably already doing it. A lot of the best business and crisis management tools are like that. Most people are already using them, but they call them things like "coping mechanisms" or "common sense" or "gut instinct." They use them without thinking, without knowing that there's a scientific explanation that ties all that common sense and gut instinct together. That explanation is called "Quality"–the science of how smart people burn down or build up businesses. Quality is the result of lots of people over lots of decades explaining common sense business principles–laying out the rules of how and why they work so that you can learn them in a way other than trial and error. In short, Quality gives us a common language and tools to explain how people make decisions and why those decisions produce good or bad results. If you aren't studying quality, you're wasting time trying to reinvent the wheel–when you could be benefiting from a century of business wisdom. 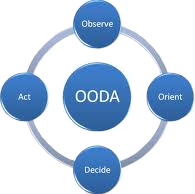 The OODA loop is one of those Quality tools that explains how people make good decisions in constantly changing environments. It was developed by USAF Colonel John Boyd in the 1990s to describe how fighter pilots react to constantly changing conditions to meet mission objectives. It is now widely used in business and litigation because it explains how to best an opponent using strategy–not brute strength. The four letters stand for Observe, Orient, Decide, and Act. Everything starts with observations about the environment, people, situations–in short, everything that can be seen, heard, felt or deduced. This is something we all do all the time. We are constantly receiving inputs. But we don't always use those inputs to our best advantage. That's why the next step is so critical. It is an unfortunate reality that most inputs produce instantaneous reactions–when we’re driving and another car veers towards us, we serve without thinking; when the boss yells at us, we get angry and defensive; the phone rings and we automatically reach for it. The daily interruptions are a testimony to the power of our conditioning to react to the inputs we receive without thinking too much. However, our conditioning is not always the best guide to what our actions should be. Seriously–if the phone ringing interrupts your marriage proposal, it’s likely to spoil the moment. The question comes to priorities. Every input can be classified in two dimensions–Important/Not Important and Urgent/Not Urgent. The phone ringing is Urgent but it may not be Important. Allowing the Urgent but Not Important to shove aside the Important but Not Urgent is a recipe for sure disaster. This is how frogs–slow crises–are born. That's where the Orient step comes in. It is the opportunity to assess the inputs, determine how they fit into everything else you know about the situation, identify options for action, and weight the potential consequences of those actions. It's about thinking about what those inputs mean in context. These are necessary in order to make informed decisions. The goal is to do these actions quickly or you may end up with Analysis Paralysis–taking so long to evaluate the options that no decision is made. Now the moment calls for a decision. The blessing and the curse of leadership is that ultimately a decision must be made consciously or someone else's behaviour will make it for you. Once the decision is made, execution becomes paramount. But it is also where the cycle starts anew. We observe the effects of our actions, the changes since we last observed the environment, people and situation, note the differences, and repeat the cycle. The more you do these steps–especially the Orient step–the better you get. The OODA Loop can be applied to an individual–in fact, Stephen R. Covey goes into this quite deeply in his book, The 7 Habits of Highly Effective People, without calling it the OODA Loop. When we are confronted with a situation, we have to stop after receiving the input, think, and then respond–rather than reacting without thinking. However effective it is for individuals, the OODA Loop gains real power when applied to an organization. In organizations, decision making problems are magnified in numerous ways. There is usually more than one person involved in the observing, orienting, deciding and acting. The observations from all the people involved have to be assembled in order to create the clearest picture of the real situation. Once the observations are collected, they must be processed and put in context so the decision maker can make a rational decision based on real knowledge, not just a bunch of facts without meaning. The difficulty for leaders is that the decision maker may not be them, but a front line employee who may not have all the resources or understanding that the leaders have. Or, worse yet, may not have the same objectives or goals. The president of SAS airlines called this “The Moment of Truth”–where the grand pronouncements of the organization met the actions of the employees who interact with customers and their expectations. When those factors converge badly, you end up with crisis. Consider the time that a United Airlines baggage handler destroyed a musician’s guitar–and that musician's music video about the incident went viral. It's when the city clerk that sends a permit holder to multiple offices to get answers after the mayor has announced a one-stop-shop approach. It's when what decision makers want doesn't match up with what other people in the organization do. This is why Orient is the most critical step in the OODA Loop. Observing, deciding and acting are “in the moment”–they happen when they happen. Orient is entirely different because it relies on doing work well before you receive input. You have to create a common language between everyone involved–including customers. You need everyone to have a common understanding of what is expected. You need everyone to understand how observations will be reported, assembled, organized, prioritized, and processed. You need everyone to understand how decisions will be made and communicated. You need everyone to understand how the execution will be controlled to produce the expected results. And all of this requires establishing trust between all parties–so people will really depend on each other. All this takes time and effort–it doesn’t happen overnight. It doesn’t happen just because you say it will. You actually have to practice doing it–making sure that everyone has the tools, resources, knowledge and motivation necessary to do their jobs.